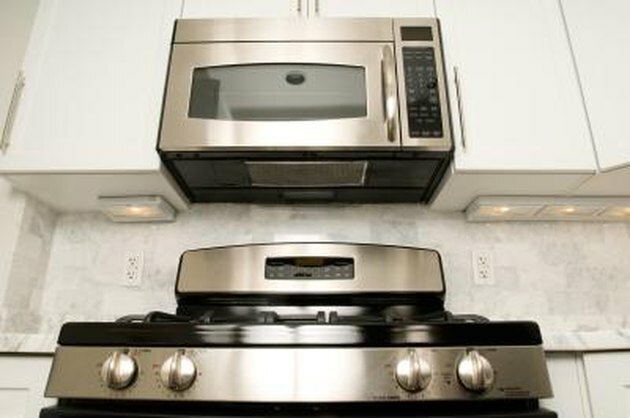 Whirlpool over-the-range microwaves vent hot air into the range hood using an automatic fan, cooling the microwave and its internal parts. Turning off this fan reduces noise from the microwave, but may in turn lead to higher internal temperatures. The vent fan control option within the microwave's setup menu controls the fan's duration, and when it turns on. Switching off the fan involves reprogramming your Whirlpool microwave. The vent fan draws hot air out of the microwave into the range hood. Press the microwave's "Control Setup" or "Options" button so the microwave display enters setup mode. Scroll to the "Vent Fan" sub-menu and press "Enter/Start." Select "Off," then press "Enter/Start" a second time to turn the vent fan off.